After the initial survey, the next step is to come up with some planning options. The main goal is to relocated the TV which caused the couch to block the fireplace. Scheme A: Placing the couch in the middle of the room facing the fireplace helps define the space. By putting the TV above the fireplace, space in also conserved. Not only does the living room set up open up to the fireplace/TV, but it also delineates a distinct circulation path from the front door to the dining/kitchen area. The couch becomes a physical barrier between the living room and Cindy's bedroom door which allows for better privacy. Cindy's armchairs now occupy the nook, creating a reading area by the shelves. Scheme B: This is a similar set up to scheme A, except the armchairs are incorporated into the living area. A chaise lounge chair seemed like the perfect piece of furniture for the nook area for some light reading by the window. Scheme C: Here the TV is placed in the nook area and a sectional sofa allows the living area to face both towards the TV and the fireplace. 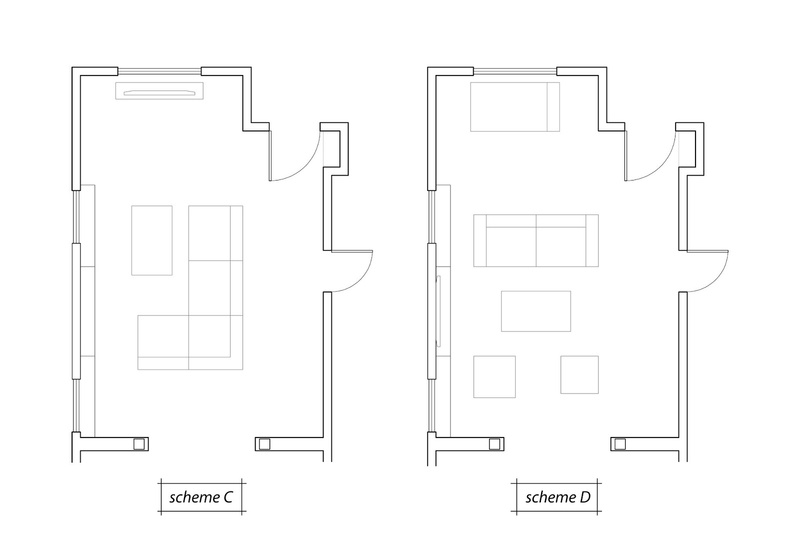 Scheme D: The living space faces inward towards itself which is a more formal configuration. The TV is above the fireplace and a chaise lounge is in the nook, similar to scheme A + B. 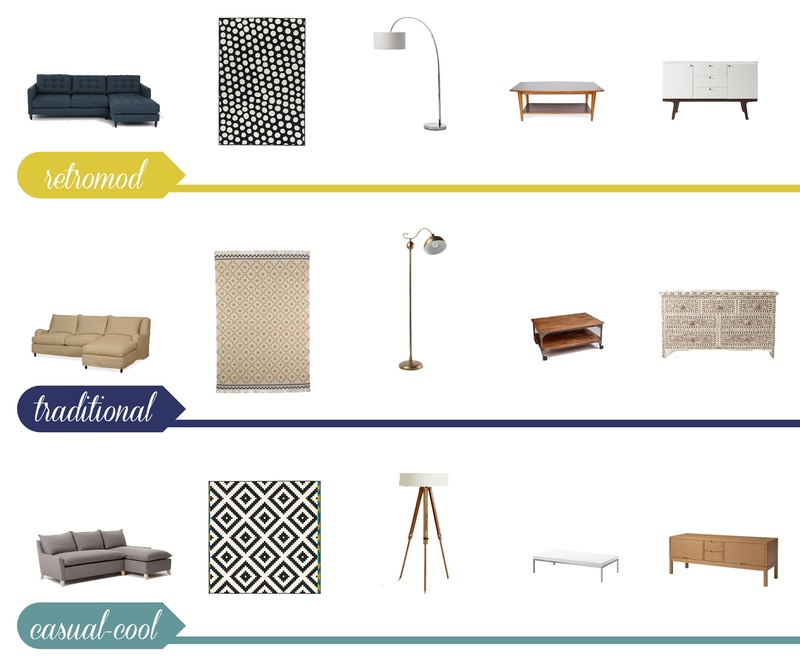 Which scheme is the best use of space, the most functional, or better for entertaining? Inspired by my favorite Emily Henderson, I decide to give Cindy a living room Style Diagnosis. Keeping in mind Cindy's sense of style, I created three general "looks" that she can choose from. Keep in mind that these pieces are representative of the style, but wouldn't necessarily be THE ones we use. The shopping comes later (fun!!). This style pulls together vintage details with tufting on the sofa, long legged furniture, etc. I think the sofa should be timeless - it's such an investment! So, the darkness of the teal makes it a hair shy of too trendy. It could be used for many looks and evolve as Cindy's style evolves. The rug is fun, and is very "Cindy" without looking like Minnie Mouse. As always, I love furniture with leeeeggs, so I had to pick as many pieces with legs as I could. This style takes into account the age of Cindy's house (over 100 years old) while keeping it modern and fresh. The living room has lots of beautiful details such as moulding, build in shelving, and a fireplace. The rolled arms of the sofa are a slight nod to the traditional look of the house. The neutral rug seems traditional due to its sedated color, but the pattern gives it a modern kick. I added the industrial style coffee table to shake things up a little. Traditional can be classy and clean and maybe boring, but the industrial piece adds a masculine edge to the room. The tv stand is actually a dresser, and totally unaffordable but definitely diy-able. This is sort of a mix of the first two - it combines both traditional and classic features. But the look is casual and cool - it's not trying too hard. The sofa is tailored but comfortable. The rug has clean lines but has fun hints of color on the edges. And the lamp, coffee table, and tv stand just scream "effortless" to me! Which one is your favorite? Which one should Cindy choose?